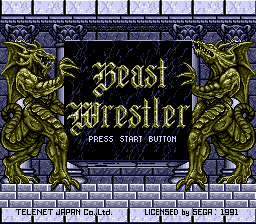 Beast Wrestler, called Beast Warriors (ビースト・ウォリアーズ) in Japan, is a 1991 fighting game for the Sega Mega Drive by Telenet Japan. You play as one of several beasts who fight each other in isometric fields. The D-pad moves around and each of , , and possibly also perform a different attack, with combinations possible. You can either play an individual match or a full tournament. A European release was planned by UbisoftMore... but it did not materialise. Main article: Beast Wrestler/Magazine articles. Main article: Beast Wrestler/Promotional material.